Readers know of my love for Sauvignon Blancs from Chile. 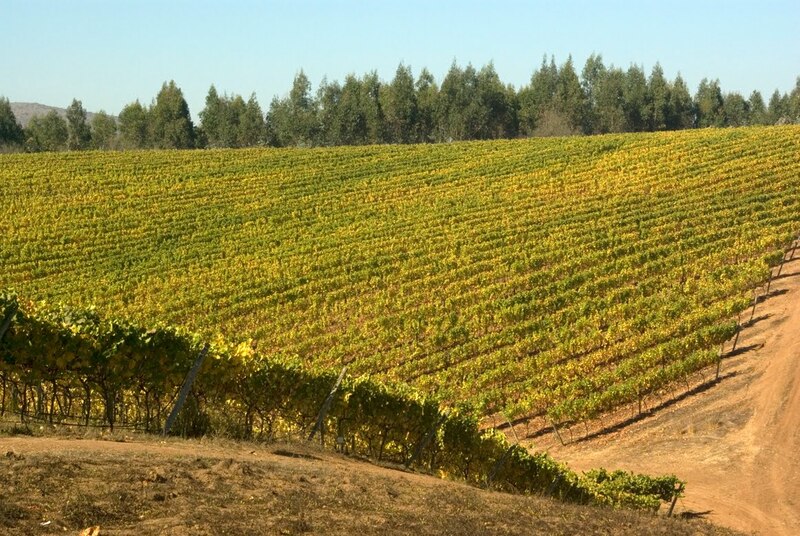 After the variety became a success in Casablanca Valley, a few vintners planted it in extremely cool zones near the ocean, such as San Antonio and Leyda Valleys. The wines from these two areas have become some the world's finest Sauvignons over the past five to seven years. Now producers in other regions are looking to the coolest reaches of their land to plant Sauvignon Blanc as well. Late last year, I wrote about the brilliant Cool Coast bottling from Casa Silva in Colchagua Valley; this wine being a signal that there were cool sites in many regions in Chile that could yield wines of great complexity. 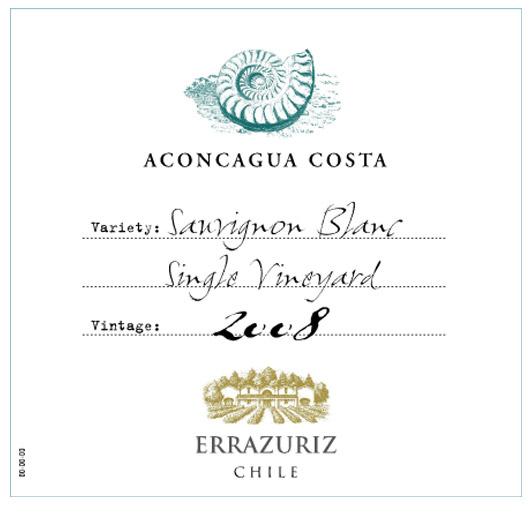 Now comes this bottling from Errazuriz in the Aconcagua Valley. 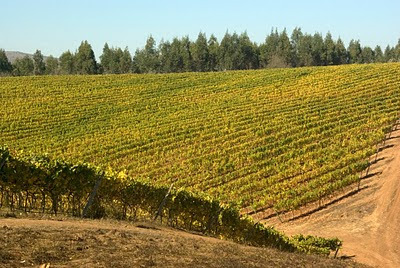 Like Colchagua, Aconcagua is thought of as a red wine zone, due to its warm inland temperatures. 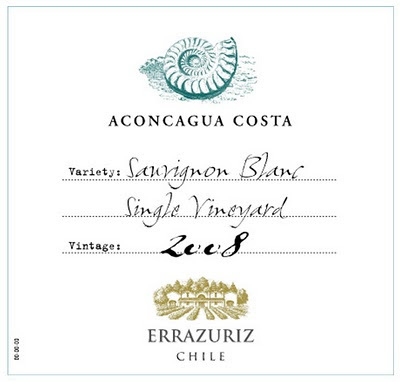 But a small area near the sea, known as Aconcagua Costa, has been developed by the winery for Sauvignon Blanc. 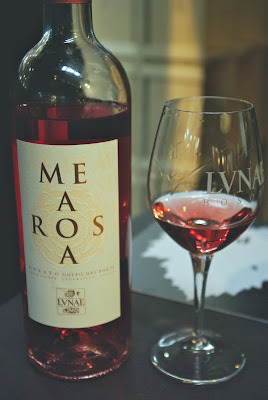 This wine was first produced from the 2008 vintage; the 2009 displays distinctive aroms of bell pepper, spearmint and lime backed by impressive depth of fruit and a lengthy finish. Although not as aromatically complex as the finest examples from Leyda and San Antonio (such as Casa Marin, Amayna and Leyda Vineyards), this has beautiful structure and should improve and drink welll for 3-5 years. The $15 price tag represents a great value! I loved the winery's 2008 Single Vineyard Carmenere, which I tried at the Wines of Chile tasting in Chicago this past April; based on these two wines, I'd have to rank Errazuriz as one of leaders of the country's wine scene. I can't wait to try the latest releases of their other specialty wines (Chardonnay Wild Ferment, Pinot Noir Wild Ferment, Single Vineyard Sangiovese). Just as in most countries around the world, Pinot Noir is a challenge in Chile. Again, look to the cool zones such as Casblanca and San Antonio for the finest examples. Now a few very good examples are emerging from the far southern region of Bio-Bio. This 2008 from Gracia is medium-bodied and focuses on wild cherry fruit along with notes of cardamom and bacon fat. It has an earthy, slightly herbal finish with very good acidity and moderate tannins; pair this with chicken in red wine or duck. While this is not a powerful wine, there is certainly a lot of character for the $12 price. 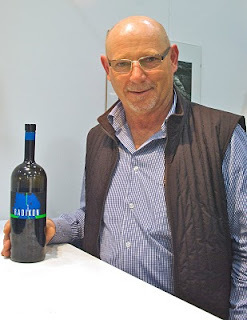 Last week, Italian wine writer Franco Ziliani (pictured above) announced that he was suspending his blog, Vinoalvino, for an indefinite time. While this may not be of great importance to most wine lovers in this country (the blog was written in Italian), I'd like to comment on this decision. Ziliani is one of most respected journalists in Italy, not only for his hard work, but also because he believes in something. That something is the love of traditionally made wines in Italy, which he believes represent the true soul of the land and the people that make these wines. More and more producers in various regions have begun to craft their wines in an international style, emphasizing ripeness and power, while at the same time deemphasizing elegance, finesse and most of all, a sense of place. I am in agreement with Ziliani on this, but even if you are not, you have to respect him for his diligence on this matter. You also have to respect his civility, as he carries himself in a proper manner, bringing his argument to the table in the right way. Unlike some bloggers or writers who trumpet themselves as the center of the universe, Franco never approached his work in that fashion. My guess as to why he decided to stop his blog at this particular time is that he is a bit burned out- after all, he was writing updates five times a week. This was of course in addition to his work as a wine writer as well as a speaker. So he's earned his rest - enjoy it, Franco! A personal note - Franco befriended me in Italy about six years ago when I wasn't that familiar with too many other journalists or producers. He came up to me at an event, introduced himself and mentioned that he would be more than happy to help me in my ventures. 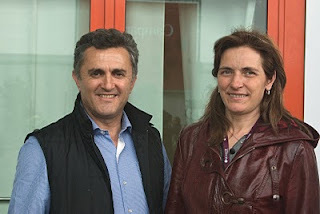 You don't get that too often these days and true to his word, Franco has remained a great friend, often highlighting my articles on the Association of Italian Sommeliers website. That's a real nice touch and I get excited every time I see my writings get featured on that site. 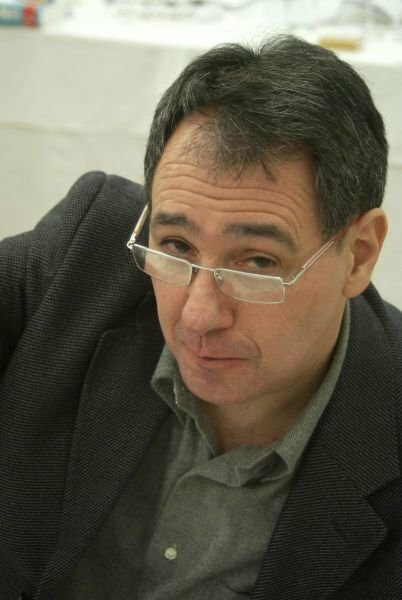 My hope in all this is that more bloggers write with the precision, determination and quality of Franco Ziliani. He updated his blog almost every day, but he had something to say. I get tired of reading blogs where it's clear that the author has little to add - he or she is merely updating because they feel they need to. In my book, less is more; there are too many wine blogs out there that offer very little in terms of opinion or news. I'm sorry, but I want to read something that's engaging - is that too much to ask? Telling me that you had a tuna fish sandwich somewhere is not of interest to anyone - keep that for your social network page or send an email, but don't update your blog just because you need more hits. Write when you have something important to say - no one is going to miss your blog if you only update once a week. 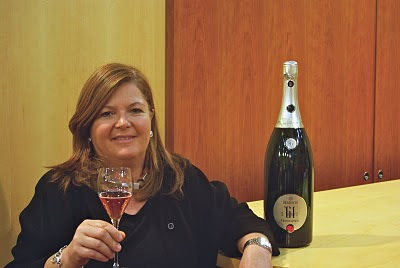 On a sad note, I just learned of the passing of Kathleen Talbert, one of my favorite people I've ever dealt with in the wine business. Kathleen headed her own PR agency, Talbert Communications in New York City and represented some pretty important accounts and people in the wine business, namely Francis Ford Coppola and his California wines. I cold always count on Kathleen to get back to me in a timely fashion. Now while most PR people do the same, Kathleen always took that extra step. One time when Coppola visited Chicago, she was kind enough to set up some time for me to interview him, despite the fact that he had a full itinerary that day. I'm sure she must have received countless requests from other journalists for a moment or two of his time, so how nice that she helped me out with this matter. Kathleen passed away on July 8 after a long struggle with cancer. Here is the link to her obituary in the New York Times. I will miss her deeply. 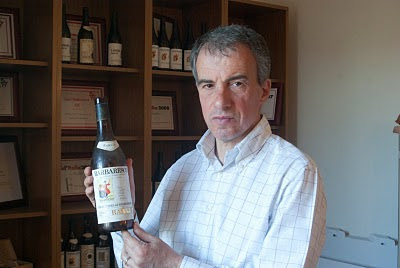 As I specialize in Italian wines, I don't try as many French wines as I would like. So when I was asked to taste a selection of 2009 Beaujolais from Georges Duboeuf with the winemaker the other day, I jumped at the chance. The initial information I received about these wines is that 2009 is "the vintage of a lifetime." I've heard comparisons like that before, so I went in with a calm manner, knowing that everyone tries to tell you that their new wines (the ones they need to sell) are great! Well, at least they didn't say the "best of the century", especially as there have only been nine harvests in the century! I sat down at Chicago's L2O restaurant with winemaker Emeric Gaucher to taste through a mix of commune as well as cru Beaujolais. 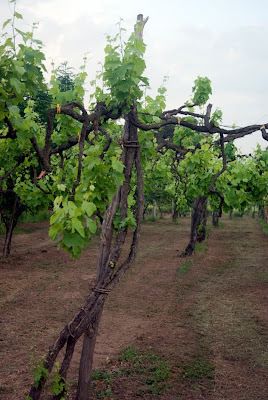 As for the claim of 2009 being a remarkable vintage, he commented that it was a growing season with "perfect conditions." That meant a sunny May, a rainy June and then two very sunny months in July and August; in fact, August 2009 was the sunniest August on the last 60 years, according to Gaucher. Combine that with the fact that methods in the vineyard and the cellar are far better now than they were sixty years ago and you have the recipe for classic wines. 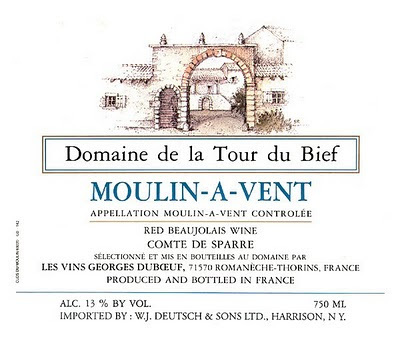 Dubeouf produces Beaujolais-Villages along with commune bottlings (Morgon, Fleurie, Moulin-a-Vent et al) as well as cru bottlings from those communes. The straight Beaujolais-Villages (every wine is is produced entirely from the Gamay grape) is always best fresh- enjoyed within 1-2 years of the vintage date, though tasting the wine three years after the harvest usually works well. 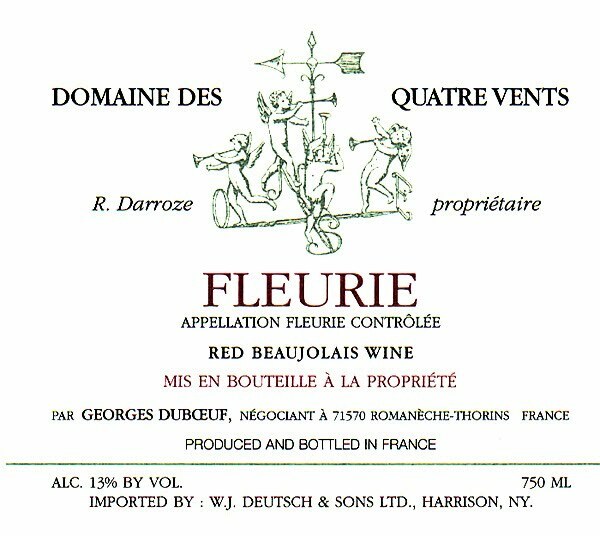 The commune Beaujolais tend to be more aromatic -wines from Fleurie have lovely floral aromatics, as befits the name - while the single estate wines offer a combination of more pronounced aromatics with greater depth of fruit and even a touch of tannin. These wines can be enjoyed 5-7 years following the harvest and in a few examples, espcially with a great vintage such as 2009, can be cellared for 7-10 years. Typical flavors and body for this wine - pleasant cranberry and red plum fruit - but much deeper color than in most years. Very pleasant - enjoy with all sorts of ligher white and red meats (ideal with cog au vin). 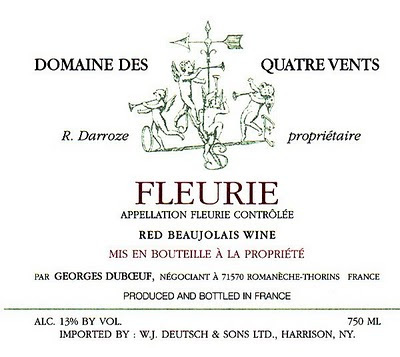 Fleurie 2009 "Domaine des Quatre Vents"
This is from a single estate ("domaine of the four winds") in Fleurie. Cranberry, roasted coffee and bacon aromas - very intriguing! Medium-full, excellent complexity - wonderful wine! Best in 5-7 years. Mulberry, mincemeat and black plum aromas; nicely balanced; enjoy over the next 3-5 years. Pair with light red meats or sautéed vegetables. Plum and cherry aromas; medium-full with notes of chocolate in the finish; enjoy over the next 3-5 years with stews, casseroles and lighter red meats (pepper steak). Julienas 2009 "Chateuau des Capitans"
Made from grapes grown at an estate owned by Dubeouf and his U.S. importer, William Deutsch (the estate's title is in their children' names). Juicy cranberry and red raspberry aromas; medium-full with a long finish and silky tannins. Notes of licorice. Best in 5-7 years; pair with roast lamb and veal. 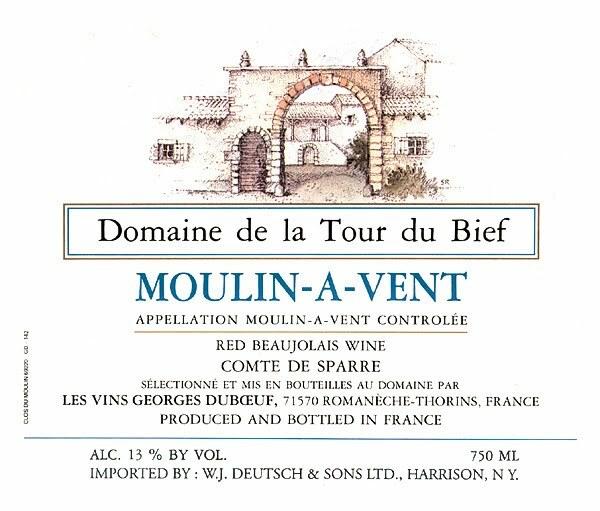 Moulin-a-Vent 2009 "Domaine de la Tour du Bief"
Moulin-a-Vent is known as the "king of Beaujolais" and this bottling offers ample evidence as to why. Roasted coffee, Queen Anne cherry aromas with a hint of black mint. Medium-full with excellent depth of fruit. Best in 7-10 years, perhaps longer. Pair with roasts and lighter game. Two notes on these wines. Also the prices of these wines are remarkably fair, from $9.99 retail for the Beaujolais-Villages to $17.99 for the Julienas "Chateau des Capitans". Everyone associates French wines with high prices (and God knows there are too many high-priced examples), so it is a great sign - especially in today's economy - to find wines of this quality for such reasonable prices. The $18 for the cru Julienas bottling is an excellent value, particularly for a wine that you can cellar for at least five years, yet enjoy tonight! Elio Grasso "Gavarini Vigna Chiniera"
Elio Grasso "Ginestra Vigna Casa Mate"
Ca'Rugate Recioto di Soave "La Perlara"
Sorelle Branca Prosecco "Particella 68"
2009 Mastroberardino Greco di Tufo "Nova Serra"
2008 Villa Diamante Fiano di Avellino "Villa della Congregazione"
2009 Luigi Maffini Fiano "Kratos"
2008 La Sibilla Falanghina "Cruna del Lago"
2009 San Paolo Falanghina "Fuoco"
2007 Livio Felluga "Terre Alte"
2009 Cantina Tramin Gewurztraminer "Nussbaumer"
2009 J. Hofstatter Gewurztraminer "Kolbenhof"
2009 Elena Walch Sauvignon "Castel Ringberg"
2008 Orsolani Erbaluce di Caluso "Vignot S. Antonio"
2008 Pieropan Soave Classico "La Rocca"
2007 Monte Tondo Soave Classico Superiore "Foscarin Slavinus"